An update to last April's post about free web-based IWBs. I figured it was time for an update, to check out new tools, and to see if there have been any changes with the apps I reviewed last year. Below I have listed 6 web-based Interactive White Board applications, and provided a little info about each. This is followed by a comparative table of some desirable functions. 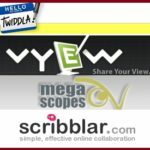 Scribblar appears to have evolved a bit since my review last year. This time I was able to get it to work. This is a nice tool for collaborating. You can easily invite others to participate, and there are plenty of useful tools for drawing and editing. You can also chat or use voice to communicate with each other. You can save images (use the Snapshot icon, which will save images to the Assets pane, where they can be downloaded from). Scribblar is definitely worth trying out! [Ed Note: As of August 2012, Dabbleboard has been shut down. Sorry!] I loved Dabbleboard last year when I took it for a test run, and have continued to use it from time to time since. It’s a useful, easy to use white board tool, with some solid functionality. I recommend giving it a try if you are interested in using a free online collaborative whiteboard. Writeboard is a text-only collaboration tool, not a drawing based tool. At first, I found this to be a turn-off, but after using the other tools, I realized that this is a good idea. If your goal is to collaborate with others on the development of a text document, the other tools here are really not functional for that. I gave Writeboard a quick test, and it was easy to use, but honestly I came away feeling that Google Docs does a better job of this. Skrbl is still in beta and there's a note right on their front page (as of this writing) stating, “skrbl is back up but some services may still be affected we'll be testing and updating ASAP”. It looks like Skrbl is still a “try at your own risk” situation. Here's a table comparing some of the features and functions of these different tools. Scriblink Yes, via email and URL (but I couldn’t get it to work!) Print, Save, or E-mail Yes Variety of paid business plans available, providing extensive customization (branding) options. Writeboard Yes, via email and URL. Yes – save the whiteboard, or export it to a txt or html file. 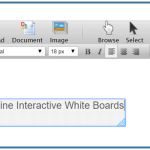 No Writeboard is a text document collaboration tool, not a drawing collaboration tool. Dabbleboard Yes (via URL). Yes (save images to Library on their site, or download as a png file) Yes Nice library function. Also has an embed feature. Has Pro version that provides privacy and branding functionality. Scribblar Yes (via email invite) Yes (save whiteboard ‘room’ on their site, or download as a jpg file) Yes Has an easy to use ‘embed’ feature that lets you embed their whiteboard ‘room’ into another web page. Skrbl Only in paid version Can save work on their site? Not clear Beta release with issues. Scribblar and Dabbleboard are both pretty solid tools and I recommend them both. ImaginationCubed is also a nice app, and it's great for doing something simple and quick, but not as robust as Scribblar and Dabbleboard. If you're interested in collaborating on a text document, Writeboard is worth trying, but Google Docs is probably a better way to go (although you do have to set up a Google Account, which is free, but a little more involved). Skrbl is just not ready for prime time, and Scriblink may not be quite there yet either (although it looks like it could be just as capable as Scribblar and Dabbleboard, if I could only figure out how to successfully collaborate with it!). At the end of last week's post, I suggested that I would probably be writing about my experiences with screen capture tool Camtasia this week, but obviously I chose not to. Camtasia just recently released an upgrade to Version 7, and I was just learning Camtasia 6, so I'm working on transitioning to and learning Ver 7 and will be blogging about it soon. In the meanwhile, I'm heading down to Orlando this week to attend Campus Management's CampusInsight Annual Conference (we use Campus Vue at the college where I work). Campus Management acquired Talisma last year, a major player in CRM in Higher Ed. I may take a bit of a tangent from my usual focus on instructional and classroom tech to discuss this exciting administrative/business app for Higher Ed. Please be sure to stop back next week and see what we're learning about! Next articleImagine Cup U.S. Finals – Voting ends midnight Saturday. I always hated how all these so-called whiteboards are full of unnecessary features, buttons, plugins and such. Whiteboards don’t work like that and they are also harmful to the student’s attention – even to mine. The only free service I found practical and useful was https://ziteboard.com but no others since. Preschoolers easily figured it out under a minute and use it just as effective as we, teachers do. Hi, thanks for creating the list I’d like to recommend http://esplice.com. I am teaching online and I believe these are great tools ! eduWeaver by BrainCert is the most advanced free online Whiteboard and Collaboration tool I have ever tried. I developed an easy and free to use interactive whiteboard for one on one teaching, without any registration required. I hope you will enjoy it! We have recently released the beta version of SymbO, the Whiteboard. Please feel free to review and send any comments. Note, we are customizing these as per user requirements and fixing the issues as noted . Thanks for providing platform to bring whiteboard community together. Great article. Good list of software to consider. It has a Free plan. It’s a completely free shared whiteboard. It’s super realtime so every stroke of your pen is instantly reflected on the screens of all viewers. All changes are saved instantly. Collaboration can be made through URL sharing, so e-mail, twitter etc. ‘Online Now’ shows currently connected users and write permission can be given or removed to any connected users. Best of all it works perfectly on iPad, iPhone, Android (using Chrome browser) and Desktops! Full disclosure, I’m the lead developer. My need is to have a shared on-line white board to monitor the tasks to be done in several projects. After reviewing the other solutions, I have decided to try the Google Drive drawings (which has a very interesting offline option). Check out this new white board – http://whiteboard.megascopes.com/. It is lightning fast, many people can use it simultaneously, it is evolving quick, and you require nothing but an HTML5 compatible browser to use it. I tried out Scriblink today, it worked fine, except that I couldn’t get the VOiP to work. Working with Maths a lot, it is great to see the LaTex provided so we can actually use the symbols we need. In the FAQ it said to be sure to keep the window open until at least one other person who would be in the conference came in as well, so I invited someone to participate with me and he did so directly and all worked fine. I am looking forward to trying it out with some maths buddies for a nice maths chat. Additonally I am looking for tools so that in the virtual class room I can look INTO the student whiteboard to find out what he/she is struggling. Are there any choices for me please? Hi, What about Vyew? That looks pretty good, too. Screenr and Sketchcast are both worth a look. Thanks Sue – I’d love to see an application of how Scribblar looks when used with Second Life. SL has real interesting potential for educators, and I’d love to see some examples of truly interactive educational applications, especially something like using an online whiteboard, shared by multiple participants, as part of the SL experience. (If anyone out there who reads this is doing this sort of thing, please tell us about it! Maybe you’d like to do a guest post about it?). Also, I’ll add Twiddla to my list of apps to check out (I took a quick peek and it certainly seems that it could belong in the above list). I’ve been looking today for an online whiteboard that will connect in-world (Second Life) and real world users. Dabbleboard and Scribblar both do the job, but Scribblar’s layout is better in-world so that’s the one I”m going with. 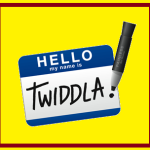 Thanks for this post and if you want only real world collaboration, take a look at Twiddla. They offer a nice free educator’s upgrade.